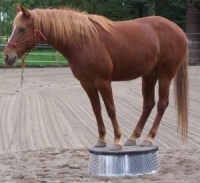 Deluxe Aluminum Natural Horsemanship Performance Pedestal. Free 48 state shipping! This is our deluxe aluminum pedestal. Like all of our aluminum models it is light enough to move around easily (just over 40 lbs) but still very strong. 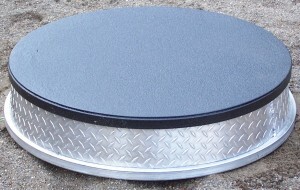 The deluxe pedestal here shows a bonded rubber top which is no longer available. They now come with a rubber matt top. Just because this is a functional piece of equipment doesn’t mean it can’t look good too so we built it using diamond plate aluminum for the sides. The top on this model is about 36″ across and it stands 8″ tall. Usually kept in stock but occasionally demand exceeds supply. If you need your pedestal right away please use the contact page to inquire about inventory and shipping schedules.